My sister and her daughter came up for a visit recently. While they were here, we drove to Whidbey Island, via Deception Pass. During our drive, we visited Coupeville, a small Island town of less than 2000 people, founded in 1852, and is the second oldest town in the State. You might also recognize the area, as several movies were filed here (An Officer and a Gentlemen, Disclosure, Twilight, An Indian Summer, Double Jeopardy, Practical Magic, and Walking Tall) Specifically Coupeville downtown was the Practical Magic's downtown featured in the first part of the movie. The producers paid the town's people to paint the town white, for the movie. Anyhow, enough with the tidbits of crap, and back to the story.... Coupeville was having a farmer’s market, where they had an amazing selection of fresh fruit and veggies. Not only did we buy a flat of fresh raspberries, but we bought some round squash ( I will be using soon), some heirloom onions, and 3 patty pan squash. Bring one inch of water to a boil in a saucepan over medium-high heat. Add squash, cover, and cook for 10 minutes, or until a fork can pierce the stem with little resistance. Drain, and slice off the top stem of the squash. Use a melon baller to carefully scoop out the centers of the squash. Reserve all of the bits of squash. Place bacon in a large, deep skillet. Cook over medium high heat until evenly brown. Remove bacon to paper towels, and set aside. Saute onion in bacon drippings. Chop the reserved squash pieces, and saute them with the onion for one minute. Remove the skillet from heat, and stir in the breadcrumbs. Crumble the bacon, and stir into the stuffing along with the Parmesan cheese. Season to taste with salt and pepper. 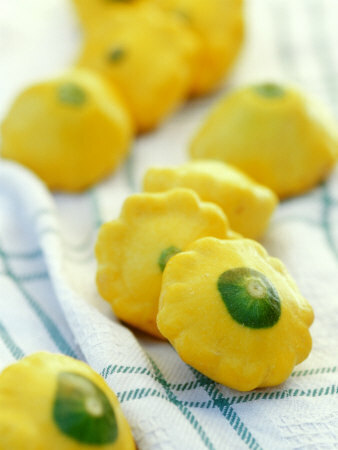 Stuff each squash to overflowing with the mixture, and place them in a baking dish. Cover the dish loosely with aluminum foil.